How to get 8(a) Certified if your firm has been in business for less than two years. b. has owned and operating a similar business concern in the past. In addition, the applicant and other key individuals of the business concern must also have the required technical capabilities, if required in your business situation. The applicant must also hold all requisite licenses and professional certifications within a firm who have been in business for less than two years. a. Details your Marketing/Sales, Products/Services, Management/Organizational/Personnel and Finance goals and demonstrated progress towards the goals you specified. b. Outlines any unique or special technical expertise that you and your team have and how you believe it will sustain your business during its early formative years. You must also provide copies of independent reference letters from your clients, directly addressed to the applicant, that establish successful contract performance. In order to prove you meet this condition, your business must have sufficient working capital. Sufficient working capital is usually defined as a minimum of 3 months worth of liquid working capital immediately available. Your business bank account (s) statements must show that you have 3 times your monthly burn rate, at a minimum. In lieu of cash, a business line of credit may be substituted. You should also describe your general payment terms and what actions your business takes to expedite the timely collection of receivables. a. Show that you billed and received a minimum of $50,000 – $100,000. You must have at least one tax return filed for the business that shows revenue earned in the primary NAICS code. This being said, you cannot apply for the waiver if your business just started up and has not filed a tax return yet. b. The contracts must be with different entities and show that not more than 70% of the total operating revenue earned is with one single entity. The 70% rule does not apply if your direct billable client is a federal, state or local government agency. Copies of all paid invoices and business bank account statements to support the operating revenue earned and collected from the contracts will need to be provided. If you have a potential federal client that may want to procure your products or services, should you become 8(a) certified, you should provide letters of noncommittal as additional evidence. In order to prove you meet this condition you must provide an explanation of current and future personnel requirements, facilities and equipment. For personnel requirements you should detail the current number of employees you have, any future hiring and how you will recruit and attract additional employees including timelines for hiring and any special relationship that exist with recruiters, personnel agencies and temporary agencies. If you want more information on becoming 8(a) Certified, please visit http://www.cloveer.com/8aprogram.html or call us at 813-333-5800. Do you meet the 70% Economic Dependency Rule? 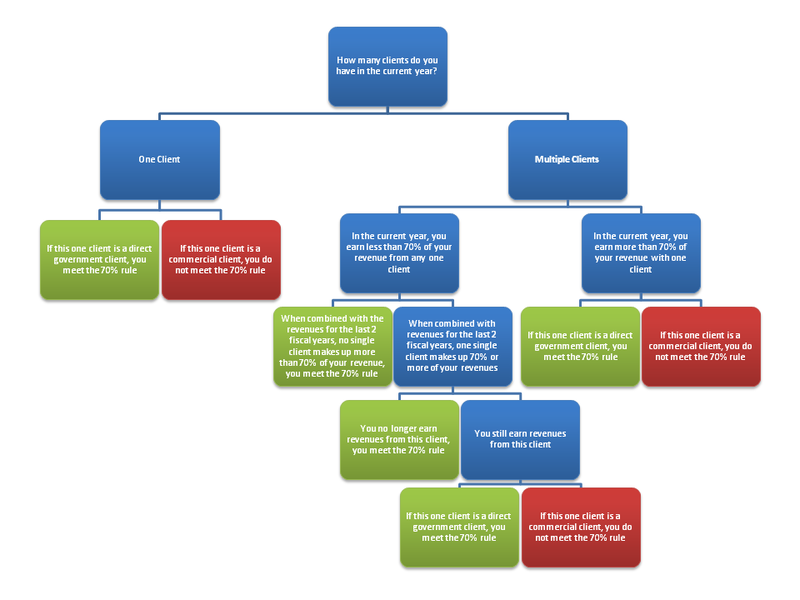 Here is a simple flow chart that will help you determine if economic dependency applies to your business. Click on the chart below to see a larger image.